The Thermo Sorvall Legend RT Refrigerated Centrifuge is an effective centrifuge that packs quite a punch with speeds of 300-15,000 RPMs. This benchtop centrifuge comes equipped with SMART spin technology which alerts the end user of imbalances. The temperature range of this Thermo Sorvall Legend RT is -9° to 40° C. The Sorvall Legend RT has a maximum capacity of three liters and can spin a wide range of sizes. The like new refrigerated centrifuge is built with a brushless motor making the centrifuge very easy to maintain. 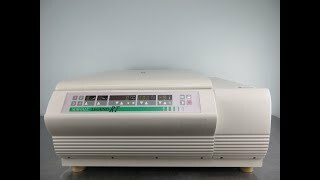 This microprocessor controlled centrifuge stores up to 4 user defined programs for quick starts of protocols that are used frequently, and from the easy to operate digital control panel, users can set speed and timer. The Thermo Sorvall Legend RT has been fully inspected and is performing to expectations. All of our lab equipment comes backed with our standard warranty. Should you have any questions, please don't hesitate to contact us.